Thailand is one of ideal destinations to spend vacations internationally. The country is renowned as an astonishing kingdom which includes Buddhist temples, impressive islands and exotic wildlife. The stable political environment along with development of Bangkok has boosted the level of Thailand tourism throughout the world. 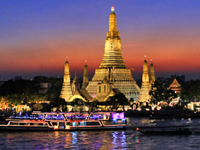 Thailand tour packages enable you to visit all the famous places including Wat Phra Kaew, Wat Pho, Grand Palace including other major attractions of the place. If you are thinking to take a break from your daily routine, nothing can be better than availing Thailand packages. These help you know diverse interesting facts about the unique culture and traditions of the country that you probably might not have known earlier. The best time to visit Thailand is from late November to February as you can enjoy pleasant climate accompanied by amusing days and pretty cold nights. The vibrant country of Thailand makes your Thailand trip more exciting and thrilling. The first major attraction of the place is Ko- Kood, a beautiful island fringed with beautiful beaches all around. In addition to this, you can pay your visit to Ayutthaya, another magnificent spot counted in one of the major attractions of Thailand. You can explore this ancient temple on river boats or even on bicycles. Owing to the popularity of the place, varied Thailand packages from Delhi are offered to prospective travelers. Moreover, there are many Thailand honeymoon packages that are specially designed for newlyweds in order to give them utmost comfort during their vacations. Couples can opt for these packages and chill out at their favorite tourist spot, that too at reasonable prices. If you want to know more about Thailand tourism, one of the best ways is to plan a visit to this country as it helps you in exploring the ancient history as well as unique traditions of Thailand.